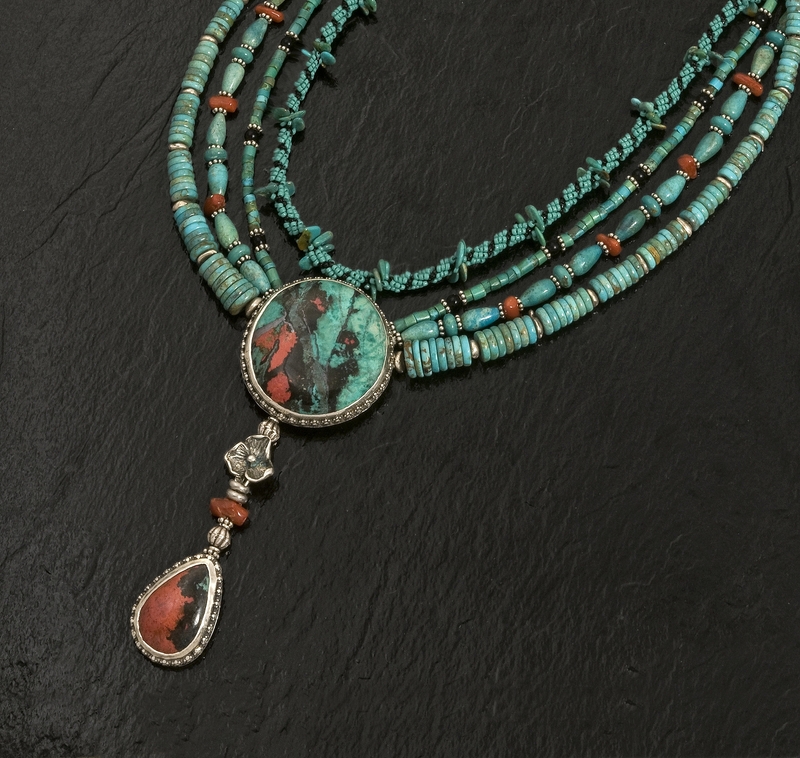 "Sonora Sunrise" is a natural admixture of chrysocolla and cuprite. The turquoise in the necklace matches the color of the chrysocolla perfectly. The centerpiece has an amazingly romantic image of a masked man holding a rose in his gauntleted hand. The dangling pendant is removable so the necklace can be worn with the round centerpiece alone. 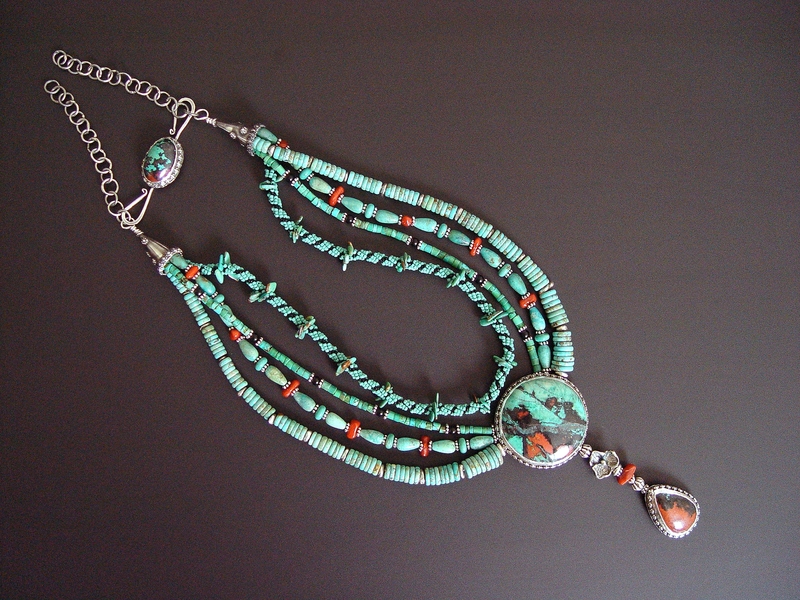 The turquoise strands are strung on cable for strength. It is rare indeed to find a natural stone with such a stunning image! Perhaps you have noticed that I seek out such stones and indeed sort through literally thousands of stones every year to find them. Gary undoubtedly cut hundreds if not thousands of pounds of this material to find this particular image. Although the rest of the Sonora Sunrise that I looked at was incredibly beautiful, not one other piece had a distinct image in it. The pendant and the stone in the closure are more typical examples. In fact, in my over 25 years in business, I have never seen as clear an image of a human being in a stone. 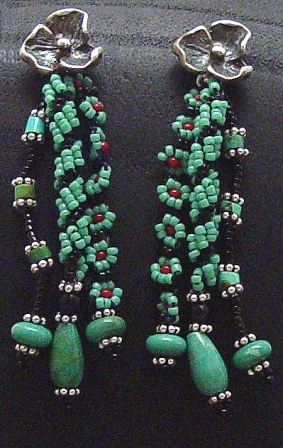 Although The Book of Stones doesn't list this stone by it's most recent name, it does mention that "Cuprite Chrysocolla ... combines an opening to powerful energies of life force and vitality with an awareness of the elements of higher consciousness... it blends the energies of masculine and feminine, physical and etheric..." Won't you order this magical set today?